Microsoft Excel is a great tool for calculations, simulations and scientific graphics. As a biochemical engineer I missed however basic chemistry functionality in this spreadsheet. That is why I developed this add-in. It provides Excel with the necessary functions to do basic chemistry calculations for educational, laboratory work and study purposes. Students can use it to check exercises or calculate solutions to chemistry problems. 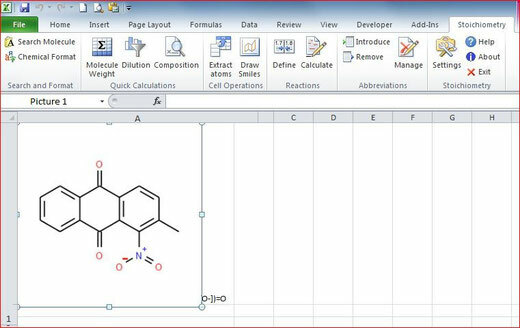 This Add-In lets you use chemical formulae in Excel spreadsheets and calculate properties like molecular weight, reaction coefficients, percent composition,... Reactions and chemical abbreviations can be saved for later use and organic molecules can be pictured using their SMILES notation. It also provides a menu for quick calculations in predefined user forms. It includes average atomic weights and an extensive list of isotope weights for calculations. As such it allows to calculate compositions and reactions with specific isotopes instead of average atomic weights. Some specific functions for mass spectroscopy are also included. Click here for more information on the functionality of the add-in. This add-in can be used on most systems with Windows Vista / Windows 7 / Windows 8 / Windows 10 and Excel 2007 / 2010 / 2013 / 2016 installed. It comes as an executable file which does not need installation, so you can also use it when you have no administrator rights on your computer. Last update: Jan. 9, 2017.